Stories from the garage, the road and the dirt with my bikes and cars. Vintage Italian moto e macchine. And other ramblings. 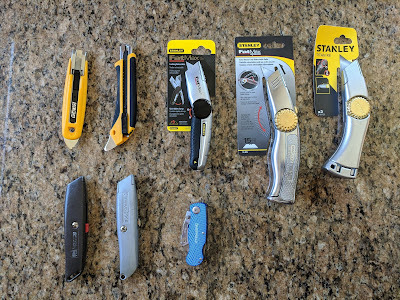 I personally purchased and tested all these knives. I broke my leg 8 weeks ago, and in my pain killer induced haze and my stir crazy condition, I ordered far too many options! Note, if you use the links in this post to buy one of the knives I will receive some compensation from Amazon. Frankly, I'm just curious if anyone will actually ever do that! 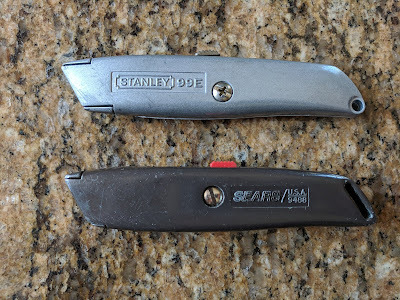 I've been using "standard" box cutters like the Stanley 99E and Sears 9488 for more than 40 years. And they have been fine and I haven't had much trouble with them. But the last couple years my use of them has changed. Now I frequently use them about once or twice a week to cut down shipping boxes to put them in our recycling container. And I have found two problems. One: changing the blade is a pain because I have to get a screwdriver. Two: we don't always close the blade all the way and leave it dangerously protruding in the drawer, just waiting to nip us when we reach for it. This style knife has multiple detents on the switch that moves the blade back and forth, and with casual use it is just too easy to miss pulling it all the way to the retracted position. So, I decided to find a better replacement. For cutting down boxes, I wanted a knife that is easy to use and automatically retracts. We have found that using regular utility knives like the Stanley 99E, sometimes the knife gets put away with the tip of the blade still extended. This knife is easy to use and solves that problem. The only negative is that it takes special blades. But these blades are made in Japan and easy to change: OLFA 9613 SKB-2/10B Trapezoid Blade, 10-Pack . We've been using this knife for a couple weeks and love it. This is a good knife, but maybe not for box cutting. 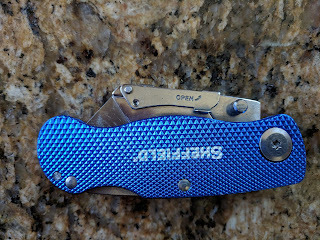 I've never liked snap off blades. I've always been concerned they might snap off at a bad time or fly through the air when snapping off. That said, it's fast to get a new cutting edge. VERY sharp, and requires special OLFA blades: OLFA UltraSharp Black Snap-Off Heavy-Duty Blade . I'll use it for fine work, but I do not recommend it for cutting down boxes. 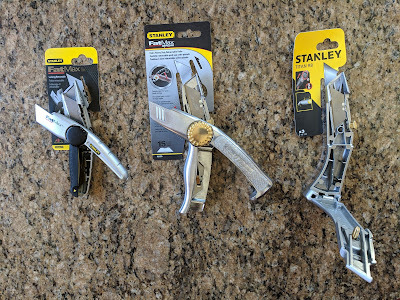 The picture above shows the various style of Stanley thumb wheel knives in the open position. Thumb dial knives have the advantage that when the dial is tight it holds the blade firmly and the blade doesn't wiggle much. But when the dial is tight, it is tough move the thumb switch that extends and retracts the blade. (It is possible to move the blade with the thumb screw tightened down, but I do not think it is intended that you use the knife that way.) So these are slow knives to use: loosen the thumb wheel, extend the blade, tighten the thumb wheel. Then when you are done, you have to loosen the thumb wheel, retract the blade, and tighten the wheel again. Really, this is best when you need a tightly held blade and don't need to retract or extend the blade. 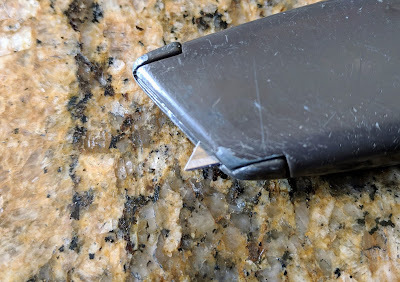 I do not think this knife is a good occasional box cutter because the thumb wheel prevents extending and retracting the blade. Thumb dial knives have the advantages and disadvantage described in italics above. It also seems expensive (approximately $15 at this moment) for it's construction. On the plus side, it feels very good in my hand! 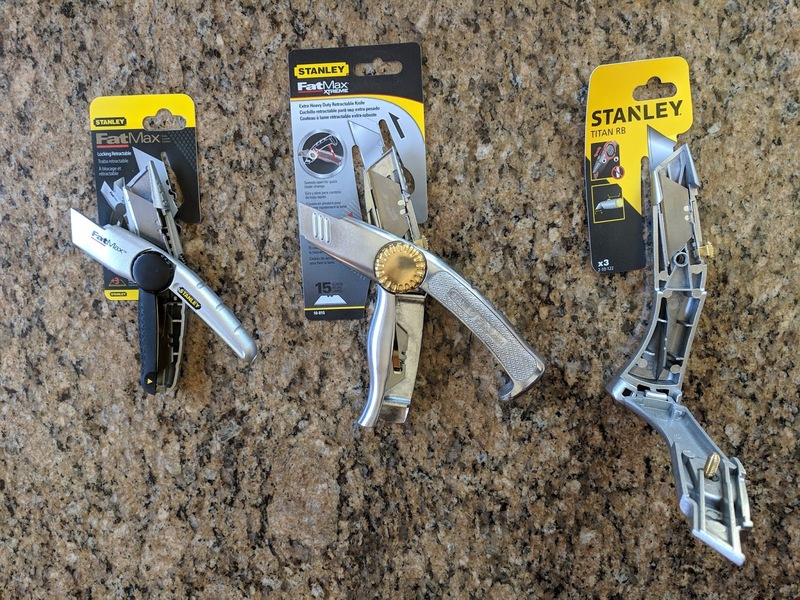 To switch blades, you have to loosen the thumb wheel all of the way and then you can pry open the handle at the yellow triangle and swing the handle open. It works, but it is awkward. It uses standard utility knife blades. This thing is hard to find... and I wouldn't use it at a occasional box cutter. But if you need a heavy duty knife, this is the one! Again: Thumb dial knives have the advantages and disadvantage described in italics above. To switch blades, it you open the thumb wheel all the way and there is a spring that automagically rotates the handle open! (You do not have to pry it like the 10-777). Very nice. The blades are held in place with a spring clip so you don't have them rattling around and getting dull. It uses standard utility knife blades. The construction on the knife if great. All metal construction. Nice castings. Brass thumb wheel. It is really solid, and it's big too, much bigger than the 10-777. If I was cutting roofing or something heavy and making lots of cuts between retractions, this would be my knife. Look for it on eBay from sellers outside the USA. If I need a heavy duty knife, this is the one I'll grab. Almost fish-like in shape! It is up to you if this shape appeals to your hand. I thought it was a bit slippery. Heavy duty, all metal construction, brass thumb wheel. Once again: Thumb dial knives have the advantages and disadvantage described in italics above. To switch blades you loosen the thumb wheel all the way and flip the handle open on the hinge. Easy enough! Unfortunately the blades are loose inside the handle and rattle, perhaps dulling them. I just didn't like how this knife felt in my hand. Note they sell versions of this knife that requires a screwdriver to open (without the brass knob), be careful what you order. These have a big following and lots of people love them. But personally, I'm not a fan. I carry a folding pocket knife all the time in my pocket, and I'm OK with the operation of opening and closing it. I'm always careful. But for casual use I don't think these are a great idea for someone who doesn't use a knife like this every day. That is the latch to release the blade, not to open the knife! Wow, that seems dangerous for a casual user. As someone familiar with these knives I didn't notice that, but the first time my wife went to open it, she started prying on that blade release and I stopped her before an accident could happen. So, I really do not recommend this knife for casual users. Leave these to the professionals. The Stanley FatMax Xtreme 10-815 Try eBay here. Hello! 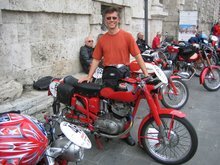 I'm Carl Liebold and this is my blog about vintage motorcycles and cars. I own the trademark: "Vintage Veloce" and have used it since the domain was first registered in February 2005. Note: liebold.com forwards to this page. Watch the 1955 Motogiro d 'Italia! Doing the Motogiro d' Italia? The trademark "Vintage Veloce" is owned by Carl Liebold. . Awesome Inc. theme. Powered by Blogger.